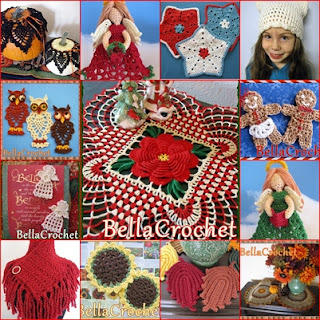 Last November, I released my Littlest Angels as a free pattern, and it quickly became the most visited page on my blog. I thought it would be fun to do a variation on them for Halloween, so I have designed the Littlest Witches for you. Note: Work Rnds 1-9 in rnds, do not join. Mark first st of each round. Stuff head with small amount of fiberfill, being careful not to stuff too tightly. Rnd 9: Sc in each st around. Rnd 10: Sc in each st around, join with sl st in first sc. Fasten off. Rnds 17-19: Sl st across to ch-2 sp of first shell, beg shell in ch-2 sp of first shell, shell in ch-2 sp of each shell around, join. Rnd 21: (Sl st, ch 1, sc) in first ch-1 sp on first scallop, (ch 3, sc in next ch-1 sp) 7 times, *sc in first ch-1 sp on next scallop, (ch 3, sc n next ch-1 sp) 7 times; repeat from * around, join with sl st in first sc. Fasten off. Note: Work in rounds, do not join. Mark first st of each round. Repeat Rnd 2 until Sleeves measure 2 ½”. At end of last round, sl st in first st of last round, fasten off. Repeat Rnd 2 until Hand measures 3/4”. Fasten off. For Straw, wrap lt. brown thread 30 times around 1” square of cardboard. Cut all strands at one fold; carefully remove strands from cardboard. Wrap a 10” strand of dk. brown thread tightly around folded strands 12 times, placing about 1/2” below remaining fold. Secure ends of dk. brown strand. Cut all strands of lt. brown at remaining fold. Trim all ends of lt. brown strands. Glue to end of stick as shown in photo. Rnd 3: Ch 3, dc in each dc around, join. (18 dc) Stuff with fiberfill. Rnds 3&4: Ch 3, dc in each dc around, join. (18 dc) At end of last round, stuff with fiberfill. With green, ch 3, in 3rd ch from hook work (dc, picot,—see Note-- ch 3, sl st.) Fasten off. 2: Insert Sleeves through Arm Openings on Witch. Insert 3” piece of chenille stem into Sleeves. Place one hand on each end of chenille stem, tucking ends of Hands inside openings of Sleeves. 3: To assemble Pumpkins, break 1” pieces from ends of toothpick. Paint about ½” at broken end with brown craft paint and allow to dry. Insert pointed end of toothpick into center of Rnd 1 of Pumpkin. Glue one Pumpkin Leaf to stem. Allow to dry. 4: Place Hat on Witch’s head and glue in place if desired. Shape Witches arms as desired. This little cutie was made by Rosina Smith. Thank you for letting me share your photo, Rosina, she is adorable! Every effort has been made to ensure this pattern is as accurate, clear, and complete as possible. All instructions have been checked and double checked and are presented in good faith. However, BellaCrochet makes no warranty and assumes no responsibility for human error, typographical mistakes or variations in individual work. 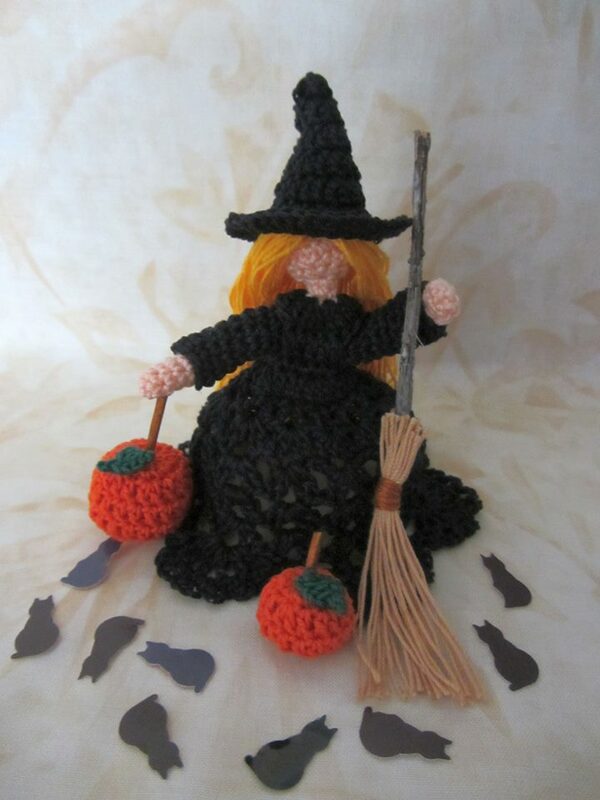 Add the Littlest Witches to your Ravelry queue: Littlest Witches. Special thanks go to Rosina Smith, Karen Misiunas and Jolene Ortiz for testing this pattern. Such an adorable design! Fun and quick to work up, too. Love it! Thank you, Ann, for another wonderful design! Cute witch. 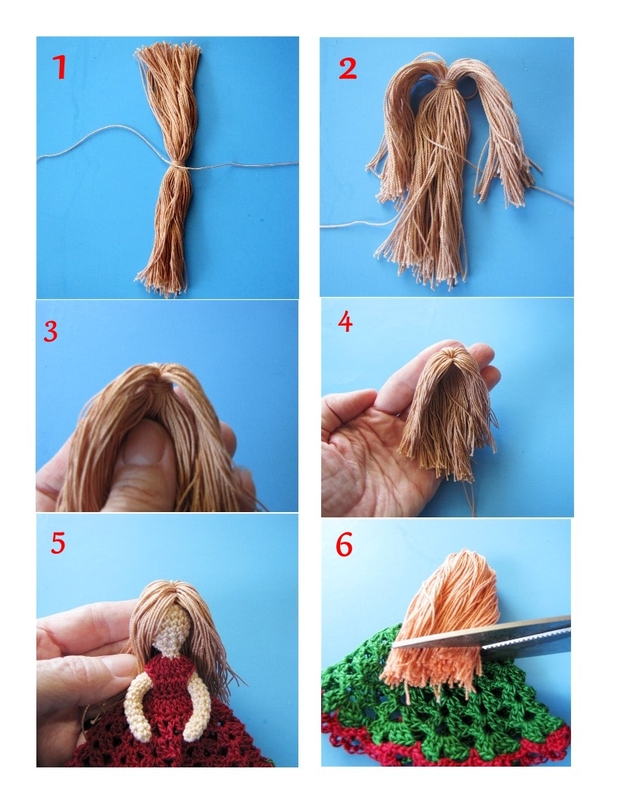 What a creative way to make hair. Thank you so much Ann... These are adorable! I love this pattern. It is so cute. Thank you, Ann, for sharing it. Hi there, love these adorable witches! I'm relatively new to crochet but your instructions are so clear that I've enjoyed this very much! Is there a simple (ish) way of making bigger versions of these witches please? Would really appreciate your help. Thank you, Emma-Jane! The easiest way I know of to enlarge these little cuties would be to use a size 3 thread instead of the size 10 called for. If you cannot find size 3, you can use two strands of size 10 held together as one throughout. Of course you will need to use a correspondingly larger hook as well. Your Littlest Witches are delightful and thank you so much for the free pattern. I hope to make some for my 5 grandchildren. They are adorable too!